Sparks’ entry adds little to the conversation. 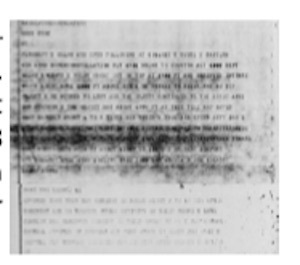 The file contains a simple message with no follow-up.2 The aircraft was flying from New Orleans to Hous- ton. When the pilot broke through the cloud layer at 1500 feet, he recognized a bright object in his path. He changed course to the right and the object moved with him. When he went to the left, the object was at a bearing of 285 degrees. He noticed the object disappeared “Towards the Fort Worth/Waco area” around 28 minutes later (1235Z => 06:35 CST). He also noted that the object was flying at a speed of 4-5 times his own True Air Speed (TAS) of 250 knots. There was no radar contact with the object from Moisant airport radar or Lake Charles radar stations. Other than this description, there was no subsequent investigation. Other than the initial movement of the object when the pilot changed his course to the right, it seems the object was at a bearing towards the West-Northwest. The true air speed of the aircraft was listed in the message is 250 knots. This is close to the cruising speed of a Constellation of about 300 knots. Assuming the plane had been traveling towards Houston at this speed for about 28 minutes, it probably was located 125-150 miles west of New Orleans. This puts the plane approaching Lake Charles, Louisiana. If the object disappeared in the direction of Fort Worth, the direction of observation was towards 290-295 degrees. The estimate of the objects air speed being 1000 or more knots, has to make one wonder about this estimate. If it were flying at 1000 knots, it certainly would not have been visible for 28 minutes and not be visible from any other aircraft or ground observers in the area. Considering the bearing to the object only appeared to be between 285 and 295 degrees, this means the object moved very little during the twenty-eight minutes relative to true north. This indicates a potential astronomical explanation. Was there a bright ob- ject visible in that direction? The bright planet Jupiter, at magnitude -2.5, was setting in the west between 1207 and 1235Z. At 1207Z, from New Orleans, Jupiter was about 5 degrees above the horizon at an azimuth of about 283 degrees. 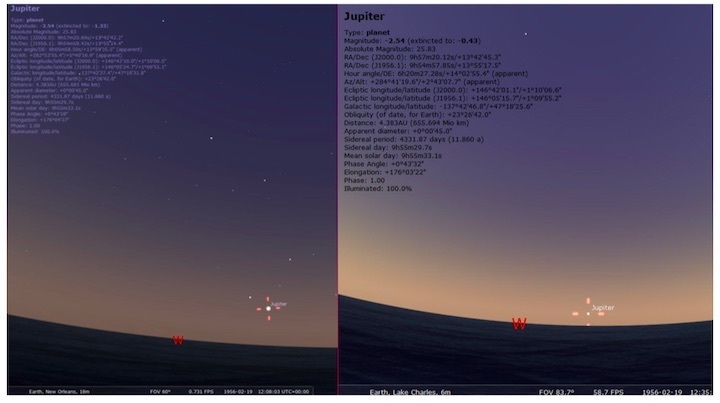 Around 1235, the sky was brightening and Jupiter was only a few degrees above the horizon around azimuth 285 degrees. Due to twilight becoming stronger, Jupiter was fading and lost most of its brilliance. It would have appeared to disappear in the distance to the observer as if it were flying away. A difference of 10 degrees in azimuth by the pilot is, in my opinion, within the margin of error. The only reason that anybody can reject Jupiter as an explanation is the claim made by the pilot that the object moved when he moved to the right. I don’t consider that problematic since the pilot then put the object on a heading of 285-295 degrees for the next 28 minutes. One could draw the conclusion that the pilot may have been in error when he made this statement. If we negate this one observation as “pilot error” or a “reporting error”, then the rest of the observations line up with the planet Jupiter. One also has to consider the fact that there was no radar contact and no other aircraft reported seeing this object come towards them or go past them. This is all indicative of a source that was probably astronomical. Therefore, in my opinion, this case should be reclassified as “probably Jupiter” and removed from the list of unknowns.